I just returned from the Santa Monica Pier on this clear and cold morning. 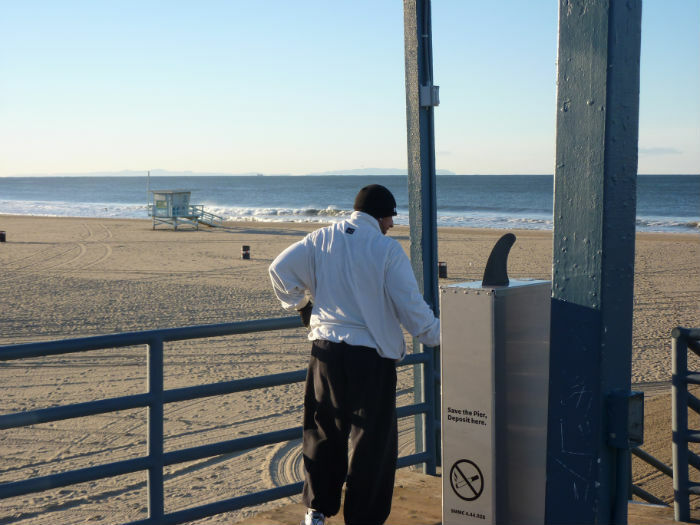 The pier was empty - it was closed off in preparations for the upcoming Rose Bowl pep rallies. So, I was able to take in the whole pier with the majestic winter sea in the background and check out the BaitTanks. 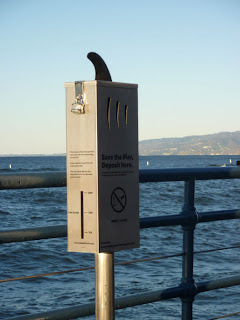 Eric, the pier maintenance manager, showed me around and told me the receptacles are already getting use! 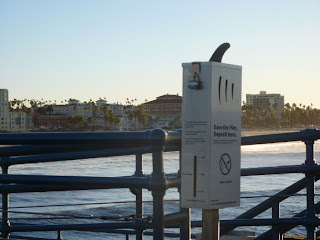 The City of Santa Monica recently banned smoking on the entire pier for several reasons. The main reason is fire prevention. 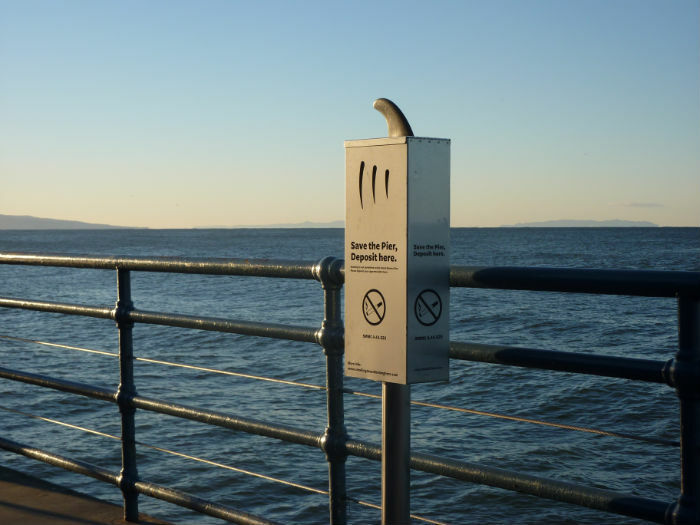 In 2010, there were a couple crazy fires that were started when tossed cigarette butts got lodged in between the pier planks. 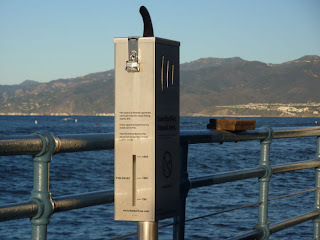 In order to communicate the new smoking ban AND offer their visitors a safe place to deposit their butts, the Santa Monica Pier Restoration Corporation turned to the BaitTank. You will notice slightly different messaging on these BaitTanks. On the front, we communicate the dangers of cigarette butts to a wooden pier, and on the side we have the established "Fish-Saved Meter" to communicate the dangers of cigarette butts to marine life. Thanks to all those who helped with the messaging, especially the City of Santa Monica Economic Development Department and Heal the Bay. Thank you also to Neal Shapiro of the Santa Monica Office of Sustainability and Environment. I am thrilled to have BaitTanks in my hometown, on the world famous Santa Monica Pier, where millions of visitors from all over the world will use them and learn from them. Great Job, keep making a difference. Yes, I am excited for the North Carolina install in Wrightsville Beach :) Bring it on NC! !